This weekend I did a little experiment. Instead of using 1 cup of peanut butter in my usual Flourless Peanut Butter Cookies, I left out the baking soda and replaced 1 cup of regular peanut butter with a 15 oz package of Jif Whips. If you haven’t tried it yet, it’s a lighter, airier version of Jif that’s easier to spread and can be used as a dip. The cookies had a robust peanut butter flavor and slightly domed tops which were perfect for draping in chocolate. Their texture was firm but not crispy and they were sweet but not overly so. I couldn’t figure out if this new rounded shape was due to the higher proportion of peanut butter and omission of baking soda or the whipped texture of the Jif Whip, so I ran another little test and weighed out the same proportions using regular peanut butter and omitting the baking soda. Again, the cookies didn’t really spread, were less sweet, and perfect for topping with chocolate. The texture was denser and heavier than the Jif Whips version but still really good. Note: For this recipe to be gluten-free, it’s important to check labels and make sure whatever brand you are using is made without wheat. In a mixing bowl, stir together all ingredients except for chocolate to form a smooth dough. Using a heaping teaspoon, spoon balls of dough onto cookie sheets. Round off the tops a little bit with your fingertips or the back of a spoon. Bake for about 9 to 11 minutes or until they appear set, then transfer to a wire rack to cool. Melt the chocolate and butter in the microwave using 50% power and stirring every 30 seconds. 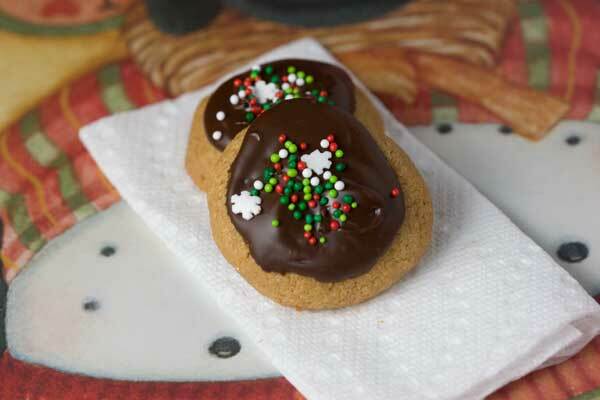 Spoon a little chocolate over the top of each cookie. Put the cookies in the refrigerator until the chocolate is set. Most peanut butter comes in 15 oz jar, so use all but about 1 1/2 tablespoons or to be more accurate, weigh out 15 oz. If you want to make the usual type of cookies which spread, use only 1 cup of peanut butter and add 1 teaspoon of baking soda. For the melted chocolate that goes on top, you can melt the chocolate by itself or add a tablespoon of butter. Butter will give the set chocolate a softer texture, whereas if you just put straight melted chocolate on top the chocolate will be harder. Dawn, there’s a product I see quite often called PB2. Is that something you could use as a substitute for your beloved TJ’s peanut flour? The Jif Whips are fun! I think Target carries them. No I haven’t tried the Jif Whips! Wow that sounds dangerous though. And I LOVE flourless peanut butter cookies. Remember that peanut flour at Trader Joe’s? Thanks!! You just made my evening. By the way, I hope you like the new navigation bar. I really don’t know what I’m doing design-wise, but I’m hoping it makes things a little easier to find. Have a great holiday season! Merry Christmas to you and your family!! !